The University of Maine men’s hockey team (8-7-1) traveled to Hamden, Conn. for a two-game series against the Quinnipiac Bobcats (6-10-2) on Friday and Saturday, Dec. 8 and 9. 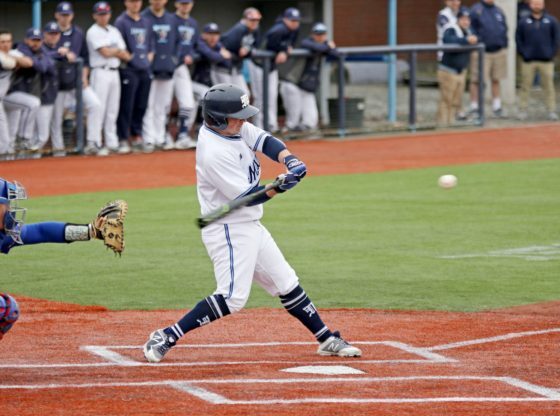 In the first game of the series, Maine defeated Quinnipiac 7-4. Friday’s game marked the 11th meeting between the two teams, with a record of 5-4-1 for the Black Bears. Starting between the pipes for the Black Bears was first-year Jeremy Swayman. Swayman was November Hockey East Pro Ambitions Rookie of the Month runner-up and is 5-3-1 with a .925 save percentage. The netminder was also recently named to the U.S. National Junior preliminary roster for the 2018 International Ice Hockey Federation (IIHF) World Junior Championship. Starting in net for the Bobcats was second-year Andrew Shortridge. He has started 12 of 13 games this season, while earning a record of 5-6-2 with a .921 save percentage. In the first period, the Bobcats went on the powerplay early when Maine took a holding penalty, but the Bobcats couldn’t capitalize on the advantage. Shortly after, Quinnipiac struck first when third-year forward Scott Davidson scored his first goal of the season, assisted by second-year defenseman Karlis Cukste and third-year defenseman Luke Shiplo. The Bobcats struck again when fourth-year forward Bo Pieper scored his third goal of the season by ripping a shot past Swayman. The goal was assisted by fourth-year Landon Smith. Quinnipiac continued the scoring when fourth-year forward Tanner MacMaster got his sixth goal of season with assists from first-year forward Odeen Tufto and third-year defenseman Chase Priskie, making it 3-0 at the midway point of the period. Second-year forward Mitchell Fossier put Maine on the board when he switched to his backhand to put it past Shortridge for his 6th goal of the season. After 20 minutes of play, Quinnipiac led in shots on goal, 23-4 and in faceoffs won, 13-9. 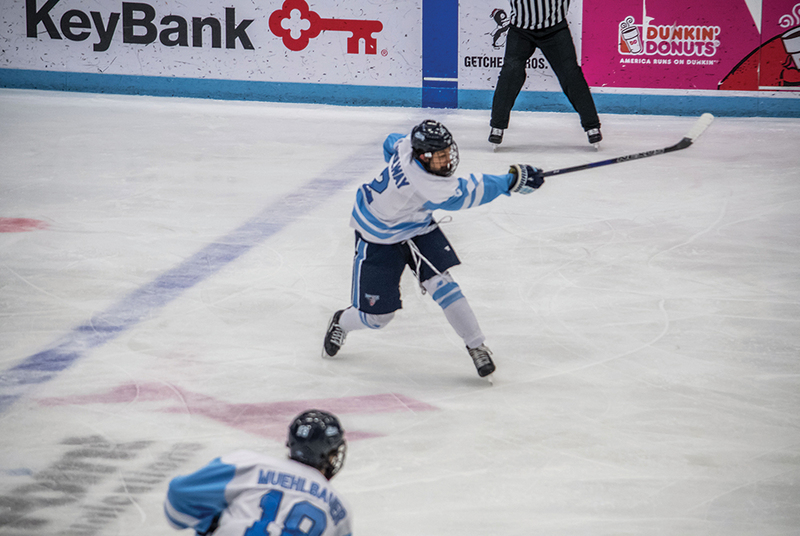 In the second period, second-year forward Tim Doherty redirected a pass from fourth-year forward Canon Pieper for his fifth goal of the season to put the Black Bears within one. Then, second-year defenseman Patrick Holway capitalized on the powerplay to tie the game up at 3. However, the Bobcats responded when Cukste scored with only 2:50 played in the third period. The goal was assisted by third-year forward Thomas Aldworth and second-year defenseman Brogan Rafferty. Shortly after, Maine tied the game up again when first-year forward Eduards Tralmaks scored his sixth goal of the season off of an individual effort. The Black Bears kept coming when fourth-year forward Cedric Lacroix got his first goal of the season off of an assist from Holway, 5-4. Tralmaks then scored his second goal of the night 30 seconds later to put Maine up by two. Then, third-year forward Brendan Robbins got in on the fun when he increased the score to 7-4 late in the third period, which would turn out to be the last goal of the game. The University of Maine men’s hockey team played their second game of the series against host Quinnipiac University on Saturday, Dec. 9. 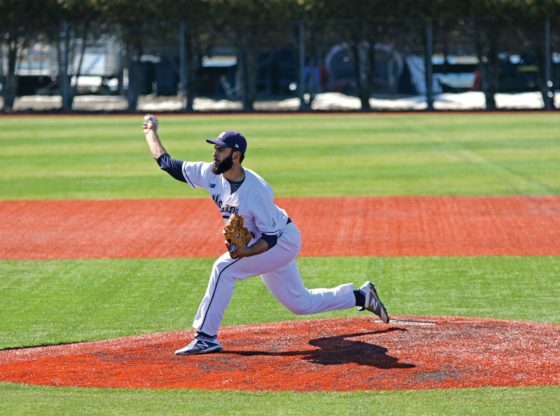 The Black Bears swept the Bobcats, with a win on Saturday, 5-3. Quinnipiac outshot the Black Bears in Friday’s game, 54-30. The Black Bears were also 2-for-2 on the man advantage and went 5-for-5 on the penalty kill. Swayman (6-3-1) started in net again for the Black Bears. On Friday, Swayman made a career-high 50 saves in the 7-4 win for the Black Bears. Shortridge (5-7-2) started in net again for the Bobcats, having faced 23 shots in Friday’s tilt. In the first period, the Bobcats went on the powerplay early when Maine took a hooking penalty, but the Bobcats couldn’t capitalize on the man advantage. The Bobcats got on the board first when second-year Logan Mick scored his third goal of the season off of a wrist shot off of the face-off, assisted by Davidson. Maine then went to the power play when Quinnipiac took a tripping penalty with 7:59 remaining in the first period. After two minutes on the power play, the Black Bears couldn’t execute. After 20 minutes of play, Quinnipiac led in shots on goal, 20-5 and in faceoffs won,14-3. In the second period, first-year Emil Westerlund put the Black Bears on the board midway through the period when he crashed the net and roofed Robbins’ rebound, 1-1. The goal was Westerlund’s. Shortly after, Quinnipiac went on the power play when Maine took an interference penalty. However, the Bobcats couldn’t convert. The Black Bears then had a power play of their own when Quinnipiac took an interference penalty, but the Bobcats killed it off. Shortly after, second-year Ryan Smith tipped a shot from Lacroix to give Maine the lead with 4:05 remaining in the period. Doherty scored a short-handed goal after finishing off a nice pass from Robbins to give the Black Bears a 3-1 lead late in the second period. After 40 minutes of play, Quinnipiac led in shots, 38-16 and blocked shots, 10-9. Maine led in faceoffs won, 26-25. In the third period, Quinnipiac opened the period with a goal from fourth-year Tanner MacMaster, assisted by Tufto and Landon Smith. Quinnipiac struck again when MacMaster tied it up, with assists from Rafferty and Landon Smith. Second-year Patrick Shea finished a rebound off of a shot from fourth-year Nolan Vesey with 24.4 seconds to go in the game. Quinnipiac then called a timeout to try to tie up the game. After the timeout, Lacroix sealed the deal with an empty net goal to finalize the score, 5-3. The Black Bears return to the ice when they travel to Troy, NY. to play Rensselaer Polytechnic Institute on Friday and Saturday, Dec. 29 and 30. Puck-drop is scheduled for 4:00 p.m. both days. Quinnipiac returns to the ice Tuesday, Jan. 2 when they travel to Hartford, Conn. to play the University of Connecticut. Puck-drop is scheduled for 7:00 p.m.